Two graduating eighth graders from Girls Prep Lower East Side Middle School have been selected to attend the Summer STEM Program at the United States Naval Academy in June. The students, Khadij and Aminata, will have the opportunity to work in world-class lab facilities and gain exposure to one of the top engineering programs in the United States, as ranked by U.S. News and World Report. 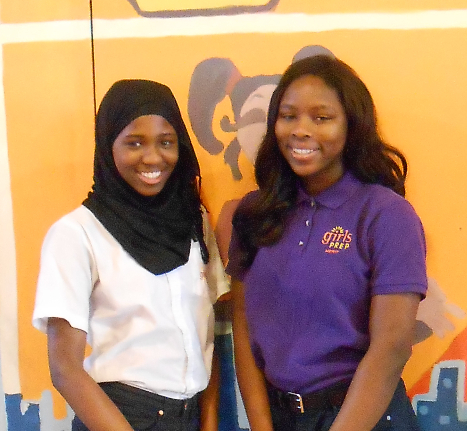 Unity sat down with Aminata and Khadij to discuss the opportunity. A portion of the interview is below. Unity: What made you decide to apply to the Annapolis STEM program? Khadij: I really like science, technology, engineering, and math. I’m planning on being a doctor, and I really liked the coding class that I took last year, so I thought this was the perfect opportunity. Aminata: I know that there aren’t many women in the STEM fields, and I’ve always liked science and math so I thought that this is the place where I can start learning more. Unity: Did your parents encourage you to apply to the summer STEM program, or did you apply all on your own? Khadij: My mom encourages me to go into the STEM fields because she says that not very many women go into STEM programs, and she said that being a doctor will help me get more money (laughter). Aminata: My parents were really excited for me, especially my father. When he was younger, he always liked STEM, like science and math, but he never really got the chance to go into that field so he was really excited for me. Unity: What did you know about Annapolis and the US Naval Academy before you applied to this program, and what did you learn through the application process? Aminata: I didn’t really know anything about it, but I spoke with [the program’s admission officer], and he told me about the Naval Academy and how it’s a military school with rigorous programs, but also how the STEM program is just focusing on STEM. Maybe we will get to experience some military things while we are there. Khadij: Before we applied, [the recruiter] came to our school to talk to us about the program, and he gave us a website to learn more about it. I went on, and I learned that they do a lot of military training for people, but at the same time they also like to focus people on subjects that are more difficult and that people don’t normally go into. Unity: How are you both feeling now that you are accepted? Aminata: I am really happy because I think that a lot of people from all over the country are going to go to the STEM program so I will be able to meet new people that think like me and also like STEM. Unity: Where are you going to high school next year? Unity: You’re both going to Bard? Aminata: She is going to Queens, and I’m going to the Manhattan campus. Unity: How long have you been at Girls Prep? Aminata: Ever since fifth grade. Unity: So Aminata, what was it like coming to Girls Prep in fifth grade when a lot of the students, like Khadij, have been coming to Girls Prep since kindergarten? Aminata: When we were first applying to the school I didn’t want to come here and leave my old school…but I came here, and I was welcomed— by some people (meaningful look at Aminata).Me and Khadij warmed up to each other over the years. Unity: So you two are friends now? Unity: What are you most looking forward to about staying overnight on a college campus? Aminata: It’s new for me. I’ve never stayed over on a campus before. I visited a college in Albany where my sister goes, and I saw how she lives; the dorms are really small, the beds are small, but I think it will be a good experience for me to see how college kids live. Khadij: When I was little, my mom wanted to finish her bachelor’s degree so I got a little inside view…I am a little disorganized, so I think being on campus in Annapolis will help me organize myself and keep track of things better.